Named HBC 672, this Sun-like star is surrounded by a debris ring of dust, rock, and ice—a disk that is too small and too distant to be seen, even by Hubble. But like a little fly that wanders into the beam of a flashlight shining on a wall, its shadow is projected large upon the cloud in which it was born. In this Hubble image, the feature—nicknamed the "Bat Shadow"—spans approximately 200 times the length of our solar system. It is visible in the upper right portion of the picture. 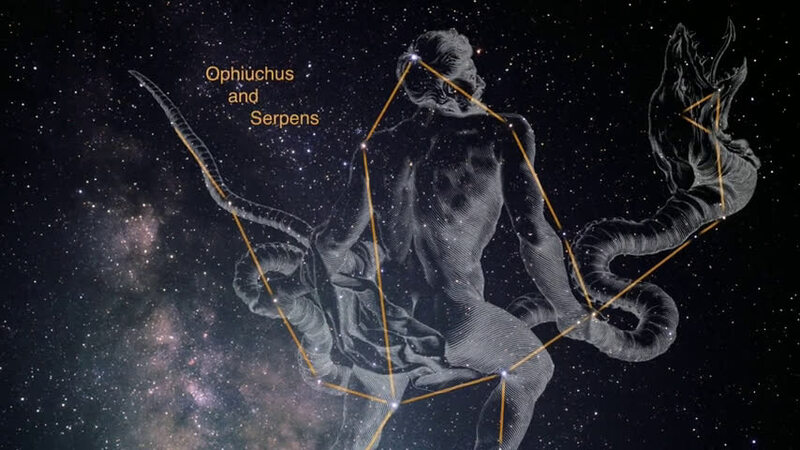 "This is an analog of what the solar system looked like when it was only 1 or 2 million years old," explained Klaus Pontoppidan, an astronomer at the Space Telescope Science Institute (STScI) in Baltimore, Maryland. "For all we know, the solar system once created a shadow like this." The presence of a shadow means that the disk is being viewed nearly edge-on. This is something that could not otherwise be known because of the disk's great distance from us, which makes it too small to be seen by Hubble. The disk's shadow is similar to what is produced by a cylindrical lamp shade. Light escapes from the top and bottom of the shade, but along its circumference, dark cones of shadow form. Although the disk that gives rise to the shadow is a common object around young stars, the combination of an edge-on viewing angle and the surrounding nebula is rare. Scientists can use the shadow to figure out the shape of the disk. For example, they now know that the disk is puffy, which implies that it is full of gas. While most of the shadow is completely opaque, scientists can look for color differences along its edges, where some light gets through. They can use the shape and color of the shadow to determine the size and composition of dust grains suspended in the disk. "These shadows are not easily seen in visible light, but the stellar disks and the shadows they project onto the surrounding nebula can be easily detected in infrared light," said Max Mutchler, a research and instrument scientist at STScI. "This infrared Bat Shadow reveals properties of both the small, dusty disk and the much larger nebula." The shadow is an example of what the future James Webb Space Telescope will be capable of studying in even greater depth. "Webb's power lies in its ability to see into the dust and gas of these disks to understand the material that comprises these environments that form planets," explained scientist Alexandra Lockwood of STScI. 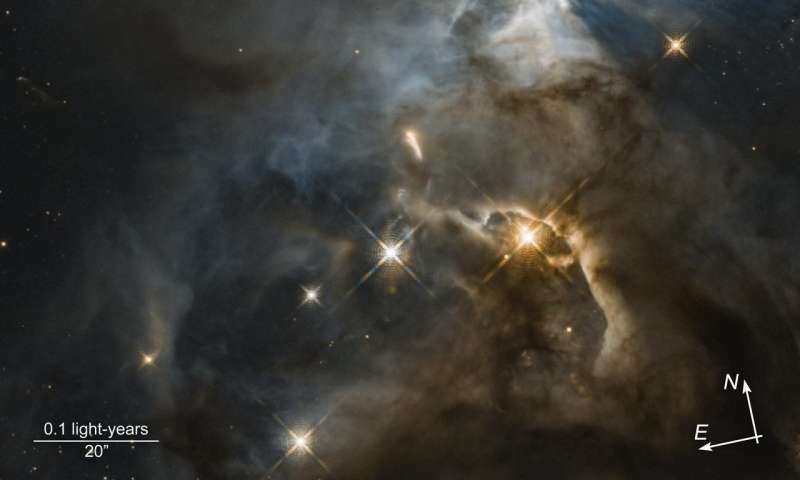 A similar-looking shadow phenomenon emanates from another young star, at the upper left of the Hubble image. At the lower right, what appears to be a void is likely a part of a foreground cloud. Light from the red, double star inside the "void" is partially blocked by this cloud. LOL Perhaps the alleged Black Holes are merely shadows also. Hopefully, the Event Horizon Telescope might be able to make that determination. Shadows don't have a mass of 4m solar masses. Shadows don't bend light around themselves. Shadows don't make stars accelerate to 3% of the speed of light at closest approach. Shadows don't make gas and dust clouds orbit them in synchronization with changing polarization. At 30% of the speed of light.